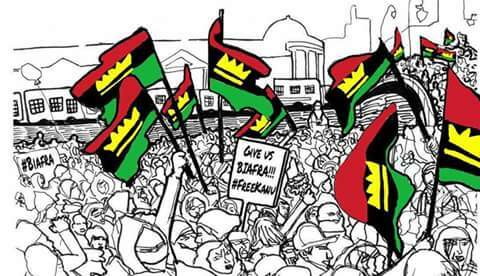 The Indigenous People of Biafra, IPOB, resident in Manchester City, United Kingdom, is set to resume its protest today, 26th October, 2017. The protest according to them, is to register their displeasure in the incessant extra-judicial killings and unlawful clampdown of IPOB civilians who are merely exercising their inalienable rights to self-determination in Nigeria. In a circular roundly signed by its Coordinator, Mazi Solomon Egbo, the Deputy Coordinator, Mazi Johnson Kalu and its Public Relations Officer, Okey Ikeme, the IPOB family called on Biafrans residing in Manchester and Greater Manchester City to join in the protest. According to the statement issued to Biafra Times/Writers Correspondent, it reads, “This is to announce to all IPOB families, all Biafrans, friends of Biafra, the Igbo community in Manchester and Greater Manchester, the Imo Kultural Welfare Union(IKWU), Anambra State Union, Enugu State Union, Abia State Union, Ebonyi State Union, Akwa Ibom State Union, Cross Rivers State (Efik) Union, Ogoni Union, Delta State Union, Bayelsa State Union, and Rivers State Union, including our brothers and sisters who are originally the indigenous people of Biafra, but due to geographical zoning they found themselves in other States around Biafra land, should attend the protest that is coming up today, the 26th of October, 2017. “The protest will be kicking off by 10am-16pm at Piccadely, Manchester. Please come with your families and let us cry to the world together on what (President) Buhari and the Zoological country called Nigeria is doing to our people. We can't stay here and watch the Zoological country called Nigeria wipe us out from the surface of the earth. Contact us on 07535375853, 07783190701, 07404597306. “As you come, Chukwu Okike Abiama will bless you and bless the Biafra nation. Iseee! Iseeee! ! Iseeeee!! !